Earlier this year, we spent one hot summer day at New Mexico's infamous Plaza Blanca landscape watching Jon Favreau, Harrison Ford, and Daniel Craig make their alien abduction Western mash-up. Here's what we learned. Plus two new behind-the-scenes images! While we can't tell you much (yet) of what we physically saw, puttering around under the desert sky of New Mexico, we have gleaned the most fantastic pieces of news that came out of the dustbowl where the cowboys made their last stand against a pack of space invaders. We all knew Harrison Ford was in Cowboys & Aliens, and would be on set. But a collective thud of journalist jaws could be heard hitting the dust as Ford strolled out donning boots and a vest with a gun at his side (classic Han Solo wear). So naturally we couldn't help attack C&A producer Bob Orci with possibly the most important question ever to be asked of this movie. Will Harrison Ford shoot first in this film? Orci smiled and confirmed that there is a "shoots first moment." Then laughed and remarked, "We're gonna fix that." So "Han Shot First" fans, this moment is for you. Sterile alien fans, we're sorry, the extraterrestrials in Cowboys & Aliens' are much more terrifying monster a la Starship Troopers, and a lot less Gort. Favreau confirmed that the beasts are in fact biological, and "more in the tradition of like Alien and Predator. [Which] allows you [to] create the biology of the alien that feels the most horrifying and feel it [out] slowly over the course of the film, as opposed to just form these columns of aliens marching..." But be sure, these bastards are not friendly, both Orci and Favreau wanted to make that very clear. Don't expect Kang and Kodos to pop up and answer all your alien questions. Favreau continued talking about the "alien invaders in the old West" plot line. With out giving too much away, he explained that the aliens' plot will have an internal logic to it, and things will be inferred, much like in Aliens. Although Favreau specifically stated not to be looking for an explanation from the monsters themselves. "We have an internal logic to it. But definitely...it's not like you're going to be cutting to the bridge of the alien ship like in the "Treehouse of Horror" [Laughs]. It's more like – you can infer certain things. Again, to me once of the best examples is Alien. There was a logic to it, but the way it unfolded, you didn't really know it. And there was enough logic to it that you could accept it. But all I knew when I watched it is, Oh, my God, what's that? There's eggs, it's on his face, it's coming out of his stomach, and they're all over the place, you can't kill them; they have acid blood. Those were things that were pulled together, saying what they were colonizing... "And although we have quite a bit of CG – I like the way they told stories before – before you could show everything with CG. And it was a real unveiling of the creature, little by little, and using lighting and camera work and music to make it a very subjective experience. And so we tried to preserve that here." They know you think the title is silly, and that's a good thing. When asked about the obvious nature of the title and some of the public's comical reaction to it, Orci was fine with it — in fact, he almost welcomed the general snickering at the mention of Cowboys & Aliens even though the movie isn't a comedy. "We tend to treat these things like a campaign," Orci explained. "And you don't want to be the front runner up front. So having a title that people snicker at is actually not a terrible thing, because when they find out what it really is, it actually compels them to discuss it and to say, 'It's not what you think.' As opposed to – you don't want to be Hillary Clinton a year out, you know. You want to be Obama a year out... We've been through this before. We've been through it with Transformers, where they thought it was – whatever you think of the movie – is it a cartoon, is it the Power Rangers? And then you see a trailer for it and you realize it's got a different scale and a different theme to it. It's the same thing with this. I think Iron Man went through a similar thing. 'Oh, it's a B grade, superhero.' Then when you see it, so – we like coming from behind, and having the title change in your perception." 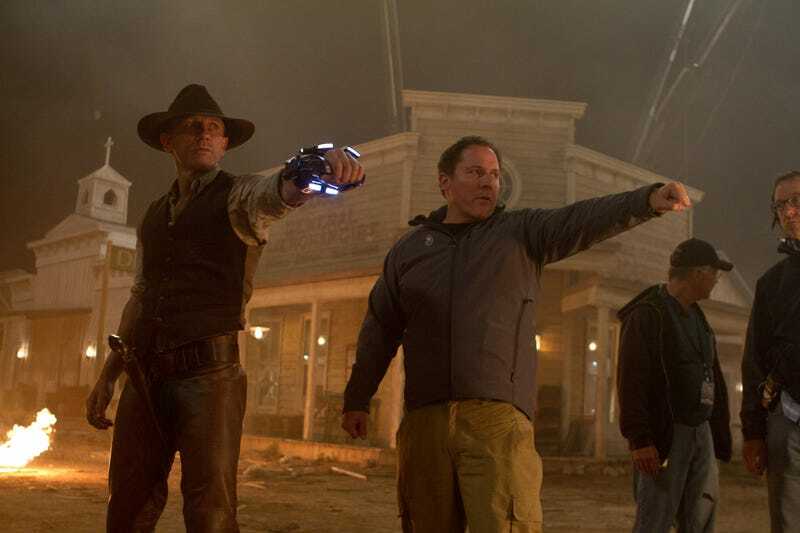 Steven Spielberg schooled Favreau and Orci on Westerns and scifi before production. It was just a DVD commentary live, with Spielberg behind us. 'Where's the horizon? Why do you think the horizon is there? What is the horizon's relationship to the actors mean about the scene?' You know, just – and we're taking notes." So what did Orci learn? "To be cautious of what you're trying to say with your framing, you know. We have a great environment here. So – and in a way, any Western tends to be about how your – one element is dealing with nature. Aliens are another facet of nature. And so how you move through the movie, and where you are in relation to nature – are you up against it? Are you down against it? Are you winning? Are you losing? Is it beating you? Or are you beating it? That becomes a conscious thing that's subliminal to the audience, but it still affects how you feel about the transition. Because in a way, this is a road movie, too. They're traveling across to get to what they need to get to. And so how the environment changes and how they change in relation to it was, you know, a big lesson from that day." So there you have it. A little bit of free movie-making advice from Spielberg. Be on the look out for the classic staples from both Westerns and Alien Invasions, but with a genre mash-up twist. A dirty saloon, a stoic main character, a mangy mutt with a sunny disposition, lights in the sky, strange alien tech all of the genre classics will be included in C&A, but each one will have an updated twist. For example as Orci explains, "The classic trope of a Western is a guy with no name comes into town, he says few words. Normally it's because he's tough and he doesn't want to give you the time of day. In this case, it's because he doesn't remember who he is because he was abducted by aliens." Favreau was quick to admit that he didn't know much about the original source material, and it seemed like the little-known book was more of a guideline than a bible for the movie. But one thing Orci (who did read the comic) kept was a classic "heartfelt parable" from inside the pages of Cowboys & Aliens, the comic. "One of the themes in the graphic novel that was good is that instead of the natives and the settlers being adversaries – they are at first, as was historically at the time, and in the time that we're doing it, is a time that natives and settlers were getting finally over their differences – but the idea that a common foe unites them." Orci revealed. "That's one of the themes of the graphic novel that we really liked." But as far as the skin melting acid laser you see on the right, that was omitted from the movie. It's not just a blend of Westerns and Scifi, it's also mixing in the alien wonderment films, darkness, invasion stories and the lone rider tale. So many movies were mentioned on set from The Searchers to Close Encounters, the most important element to making this mix work was easily the overall tone of the film. "I think what's nice about the piece that we showed at Comic Con, is I think it shows the marriage.' Favreau explains. "If you buy that it starts off with the lone rider, and ends with the town blowing up – if that progression doesn't balk for you, that's kind of the world of our movie. So it's – and as a director, my biggest responsibility is tone. And whether I'm making a Western or a scifi movie, I would still have that responsibility. And I think I found the tone that marries the two. And it's a balancing act, and that's what makes this movie work, and that will work. And I think where westerns have failed in recent years is that they got the tone wrong." John Wayne's legacy lives on amongst the alien invaders. The collection of impressive names attached to this feature doesn't just stop after Spielberg and Ron Howard. Terry Leonard's is the Second Unit Director who has been coordinating and executing stunts for years on films such as McLintock! and Planet of the Apes. He worked with John Wayne countless times. And speaking of the Wayne legacy, his grandson Brendan Wayne plays Deputy Lyle to THE Keith Carradine (playing Sheriff Taggart). Also cast is beloved character actor Sam Rockwell, infamous Western bad guy Walton Goggins (who was sporting a nasty set of mangled fake teeth), and Paul Dano of There Will Be Blood acclaim. No sequels or franchise plans...yet. Admit it, it's kind of nice when the movie makers are just focused on making the film in front of them. Both Orci and Favreau didn't really press the idea of a sequel or franchise, in fact they both seemed pretty intent on making this a stand-alone feature. But then again, box office sales can and will change everything.